អត្ថបទនេះស្ដីអំពី the city of Manchester in England។ ចំពោះthe larger conurbation សូមមើល Greater Manchester Built-up Area។ ចំពោះ the wider metropolitan countyសូមមើល Greater Manchester។ ចំពោះ the city in New Hampshireសូមមើល Manchester, New Hampshire។ For other uses, see Manchester (disambiguation). The recorded ប្រវត្តិសាស្រ្តមែនឈេសទ័រ បានចាប់ផ្តើមជាមួយនឹងការតាំងទីលំនៅស៊ីវិលភ្ជាប់ជាមួយ រ៉ូម៉ាំង fort of Mamucium or Mancunium, ដែលបានបង្កើតឡើងនៅប្រហែល AD 79 នៅលើការបោកបញ្ឆោតថ្មភក់មួយនៅជិតចំណុចប្រសព្វនៃទន្លេមេតល៉ោក និងអ័រវ៉ែល។ វាគឹជាផ្នែកមួយនៃលាំងហ្គាស៊ីនៅប្រវត្តិសាស្ត្រ បើទោះបីជាតំបន់នៃ ឈេសស៊ី ភាគខាងត្បូងនៃ ទន្លេមើស៊ី ត្រូវបានដាក់បញ្ចូលនៅក្នុងសតវត្សរ៍ទី ២០។ នៅទូទាំងមជ្ឈឹមវ័យ មែនឈេសទ័រ remained a manorial township but began to expand "at an astonishing rate" around the turn of the 19th century. 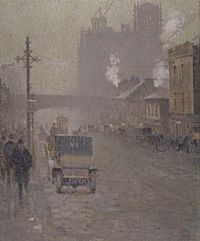 Manchester's unplanned urbanisation was brought on by a boom in textile manufacture during the Industrial Revolution, and resulted in it becoming the world's first industrialised city. Manchester achieved city status in 1853. The Manchester Ship Canal opened in 1894, creating the Port of Manchester and linking the city to sea, ៣៦ ម៉ាយល៍ (៥៨ គ.ម.) to the west. Its fortunes declined after the Second World War, owing to deindustrialisation, but the IRA bombing in 1996 led to extensive investment and regeneration. In 2014, the Globalization and World Cities Research Network ranked Manchester as a beta world city, the highest-ranked British city apart from London. 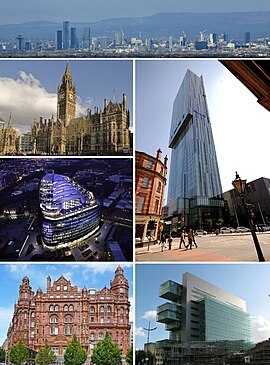 Manchester is the third-most visited city in the UK. It is notable for its architecture, culture, musical exports, media links, scientific and engineering output, social impact, sports clubs and transport connections. Manchester Liverpool Road railway station was the world's first inter-city passenger railway station and in the city scientists first split the atom and developed the stored-program computer. 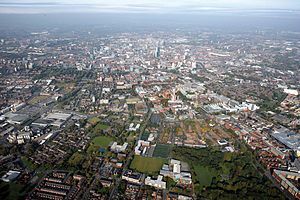 The name Manchester originates from the Latin name Mamucium or its variant Mancunium and the citizens are still referred to as Mancunians (/mæŋkˈjuːnɪənz/). These are generally thought to represent a Latinisation of an original Brittonic name, either from mamm- ("breast", in reference to a "breast-like hill") or from mamma ("mother", in reference to a local river goddess). Both meanings are preserved in languages derived from Common Brittonic, mam meaning "breast" in Irish and "mother" in Welsh. The suffix -chester is a survival of Old English ceaster ("fort; fortified town"). The Manchester Ship Canal was built between 1888 and 1894, in some sections by canalisation of the Rivers Irwell and Mersey, running ៣៦ ម៉ាយល៍ (៥៨ គ.ម.) from Salford to Eastham Locks on the tidal Mersey. This enabled oceangoing ships to sail right into the Port of Manchester. On the canal's banks, just outside the borough, the world's first industrial estate was created at Trafford Park. Large quantities of machinery, including cotton processing plant, were exported around the world. Like most of the UK, the Manchester area was mobilised extensively during the Second World War. For example, casting and machining expertise at Beyer, Peacock and Company's locomotive works in Gorton was switched to bomb making; Dunlop's rubber works in Chorlton-on-Medlock made barrage balloons; and just outside the city in Trafford Park, engineers Metropolitan-Vickers made Avro Manchester and Avro Lancaster bombers and Ford built the Rolls-Royce Merlin engines to power them. Manchester was thus the target of bombing by the Luftwaffe, and by late 1940 air raids were taking place against non-military targets. The biggest took place during the "Christmas Blitz" on the nights of 22/23 and 24 December 1940, when an estimated ទំព័រគំរូ:Convert/LoffAoffDflipSoffNa of high explosives plus over 37,000 incendiary bombs were dropped. A large part of the historic city centre was destroyed, including 165 warehouses, 200 business premises, and 150 offices. 376 were killed and 30,000 houses were damaged. Manchester Cathedral was among the buildings seriously damaged; its restoration took 20 years. Manchester has a history of attacks attributed to Irish Republicans, including the Manchester Martyrs of 1867, arson in 1920, a series of explosions in 1939, and two bombs in 1992. 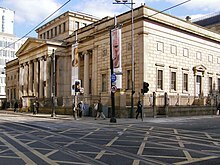 On Saturday 15 June 1996, the Provisional Irish Republican Army (IRA) carried out the 1996 Manchester bombing, the detonation of a large bomb next to a department store in the city centre. The largest to be detonated on British soil, the bomb injured over 200 people, heavily damaged nearby buildings, and broke windows 1⁄2 ម៉ាយល៍ (៨០០ ម) away. The cost of the immediate damage was initially estimated at £50 million, but this was quickly revised upwards. The final insurance payout was over £400 million; many affected businesses never recovered from the loss of trade. On 22 May 2017, the Manchester Arena bombing resulted in 22 fatalities and 120 injuries. It has been treated as a terrorist-suicide attack. At 53°28′0″N 2°14′0″W﻿ / ﻿53.46667°N 2.23333°W﻿ / 53.46667; -2.23333, ១៦០ ម៉ាយល៍ (២៦០ គ.ម.) 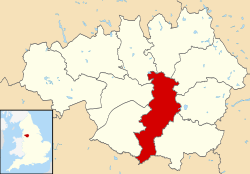 northwest of London, Manchester lies in a bowl-shaped land area bordered to the north and east by the Pennines, a mountain chain that runs the length of northern England, and to the south by the Cheshire Plain. Manchester is ៣៥,០ ម៉ាយល៍ (៥៦,៣ គ.ម.) north-east of Liverpool and ៣៥,០ ម៉ាយល៍ (៥៦,៣ គ.ម.) north-west of Sheffield, making the city the halfway point between the two. The city centre is on the east bank of the River Irwell, near its confluences with the Rivers Medlock and Irk, and is relatively low-lying, being between ទំព័រគំរូ:Convert/Dual/LoffAnoneDflipSoff above sea level. The River Mersey flows through the south of Manchester. 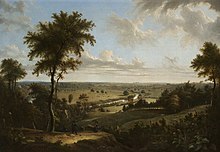 Much of the inner city, especially in the south, is flat, offering extensive views from many highrise buildings in the city of the foothills and moors of the Pennines, which can often be capped with snow in the winter months. Manchester's geographic features were highly influential in its early development as the world's first industrial city. These features are its climate, its proximity to a seaport at Liverpool, the availability of water power from its rivers, and its nearby coal reserves. Manchester experiences a temperate Oceanic climate, like much of the British Isles, with mild summers and cool winters. Summer daytime temperatures regularly top 20 Celsius, typically reaching 25 Celsius on sunny days throughout July and August in particular. In more recent years, temperatures now reach over 30 Celsius on occasions. In Winter, temperatures rarely dip below freezing anymore. There is regular but generally light precipitation throughout the year. The city's average annual rainfall is ៨០៦,៦ millimet្រ (៣១,៧៦ in) compared to the UK average of ១១២៥,០ millimet្រ (៤៤,២៩ in), and its mean rain days are 140.4 per annum, compared to the UK average of 154.4. Manchester however has a relatively high humidity level and this, along with the abundant supply of soft water, was one of the factors that led to the localisation of the textile industry in the area. Snowfalls are not common in the city, due to the urban warming effect. However, the Pennine and Rossendale Forest hills that surround the city to its east and north receive more snow and roads leading out of the city can be closed due to snow. notably the A62 road via Oldham and Standedge, the A57 (Snake Pass) towards Sheffield, and the M62 over Saddleworth Moor. 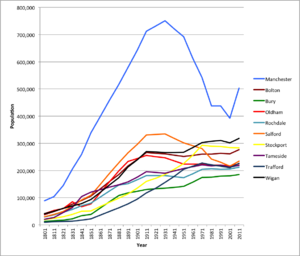 The Greater Manchester Built-up Area had a population of 2,553,400 (2011 est.,). 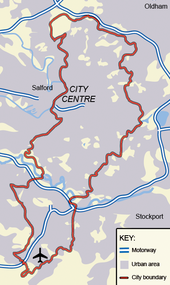 An estimated 2,702,200 people live in Greater Manchester (2012 est.,). 6,547,000 people live within ៣០ ម៉ាយល៍ (៤៨ គ.ម.) of Manchester (2012 est.,) and 11,694,000 within ៥០ ម៉ាយល៍ (៨០ គ.ម.) (2012 est.,). In terms of ethnic composition, the City of Manchester has the highest non-white proportion of any district in Greater Manchester. Statistics from the 2011 census showed that 66.7% of the population was White (59.3% White British, 2.4% White Irish, 0.1% Gypsy or Irish Traveller, 4.9% Other White – although those of mixed European and British ancestry is unknown; there are reportedly over 25,000 Mancunians of at least partial Italian descent alone which represents 5.5% of the city's population). 4.7% were mixed race (1.8% White and Black Caribbean, 0.9% White and Black African, 1.0% White and Asian, 1.0% Other Mixed), 17.1% Asian (2.3% Indian, 8.5% Pakistani, 1.3% Bangladeshi, 2.7% Chinese, 2.3% Other Asian), 8.6% Black (5.1% African, 1.6% Other Black), 1.9% Arab and 1.2% of other ethnic heritage. Manchester also has a number of skyscrapers built during the 1960s and 1970s, the tallest of which was the CIS Tower located near Manchester Victoria station until the Beetham Tower was completed in 2006; it is an example of the new surge in high-rise building and includes a Hilton hotel, a restaurant, and apartments. It remains the tallest building outside London and has been described as the United Kingdom's only true skyscraper outside the capital. The Green Building, opposite Oxford Road station, is a pioneering eco-friendly housing project, while the recently completed One Angel Square, is one of the most sustainable large buildings in the world. The award-winning Heaton Park in the north of the city borough is one of the largest municipal parks in Europe, covering ៦១០ អេកឺរ (២៥០ ha) of parkland. The city has 135 parks, gardens, and open spaces. Manchester Piccadilly Station, the busiest of the four major railway stations in the Manchester station group with over 25 million passengers using the station in 2016. Manchester Liverpool Road was the world's first purpose-built passenger and goods railway station, and served as the Manchester terminus on the Liverpool and Manchester Railway – the world's first inter-city passenger railway. Today the city is well served by the rail network, and is at the centre of an extensive countywide railway network, including the West Coast Main Line, with two mainline stations: Manchester Piccadilly and Manchester Victoria. The Manchester station group – comprising Manchester Piccadilly, Manchester Victoria, Manchester Oxford Road and Deansgate – is the fourth busiest in the United Kingdom, with 41.7 million passengers recorded in 2013. On 7 February 2014, construction of the £600m Northern Hub project, which aims to increase capacity and reduce journey times across the North, began with construction work commencing on a 4th platform at Manchester Airport railway station. The High Speed 2 link to Birmingham and London is also planned, which, if built, will include a ១២ គ.ម. (៧ ម៉ៃ.) tunnel under Manchester on the final approach into an upgraded Piccadilly station. Manchester Metrolink is the largest tram system in the UK, with a total route length of ៥៧ ម៉ាយល៍ (៩២ គ.ម.). Manchester became the first city in the UK to acquire a modern light rail tram system when the Manchester Metrolink opened in 1992. 25 million passenger journeys were made on the system in 2012/13. The present system mostly runs on former commuter rail lines converted for light rail use, and crosses the city centre via on-street tram lines. The ៤៥,៦ ម៉ៃ. (៧៣,៤ គ.ម. )-network consists of six lines with 69 stations (including five on-street tram stops in the centre). An expansion programme is underway which will create four new lines to add to the current three and will be at least 99 stops, 62 more than in 2010. Manchester city centre is also serviced by over a dozen heavy and light rail-based park and ride sites. A smaller airfield, City Airport Manchester, also exists ៩,៣ គ.ម. (៦ ម៉ៃ.) to the west of Manchester city centre. It was Manchester's first municipal airport, and became the site of the first Air traffic control tower in the UK, and the first municipal airfield in the UK to be licensed by the Air Ministry. Today, private charter flights and general aviation use the airfield, it also has a flight school, and both the Greater Manchester Police Air Support Unit and the North West Air Ambulance have helicopters based at the airfield. Bands that have emerged from the Manchester music scene include Oasis, The Smiths, Joy Division and its successor group New Order, Buzzcocks, The Stone Roses, The Fall, 10cc, Godley & Creme, The Verve, Elbow, Doves, The Charlatans, M People, The 1975, Simply Red, Take That and The Outfield. Manchester was credited as the main driving force behind British indie music of the 1980s lead by The Smiths, later including The Stone Roses, Happy Mondays, Inspiral Carpets, and James. 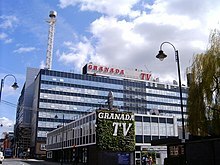 The later groups came from what became known as the "Madchester" scene that also centred on The Haçienda nightclub developed by founder of Factory Records Tony Wilson. Although from southern England, The Chemical Brothers subsequently formed in Manchester. Former Smiths frontman Morrissey, whose lyrics often refer to Manchester locations and culture, later found international success as a solo artist. Previously, notable Manchester acts of the 1960s include The Hollies, Herman's Hermits, and Davy Jones of the Monkees (famed in the mid-1960s for not only their albums but also their American TV show) and the earlier Bee Gees, who grew up in Chorlton. Another notable contemporary band from Manchester is The Courteeners consisting of Liam Fray and four close friends. Singer-songwriter Ren Harvieu is also from Greater Manchester. Among 20th century writers from Manchester is Anthony Burgess, who wrote the dystopian satire A Clockwork Orange in 1962. Dame Carol Ann Duffy, the current Poet Laureate, moved to the city in 1996 and lives in West Didsbury. Poet, novelist and academic Jackie Kay also lives in the city. The night-time economy of Manchester has expanded significantly since about 1993, with investment from breweries in bars, public houses and clubs, along with active support from the local authorities. The more than 500 licensed premises in the city centre have a capacity to deal with more than ២៥០០០០ visitors, with 110–១៣០០០០ people visiting on a typical weekend night. The night-time economy has a value of about £100 million and supports ១២០០០ jobs. Public houses in the Canal Street area have had a homosexual clientele since at least 1940, and now form the centre of Manchester's homosexual community. 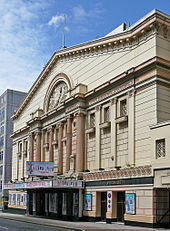 Since the opening of new bars and clubs, the area attracts 20,000 visitors each weekend and has hosted a popular festival, Manchester Pride, each August since 2003. 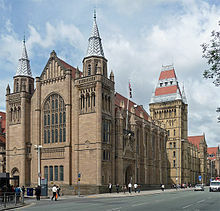 Whitworth Hall at the University of Manchester, with approximately 40,000 students it is the largest university in the UK in terms of enrolment. The Etihad Stadium, host stadium for the 2002 Commonwealth Games and home of Manchester City F.C. The Guardian newspaper was founded in 1821 as The Manchester Guardian. 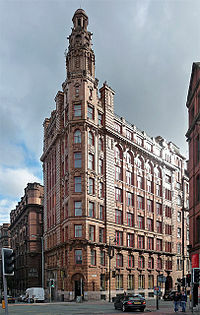 Its head office is still in the city, though many of its management functions were moved to London in 1964. Its sister publication, the Manchester Evening News, has the largest circulation of a UK regional evening newspaper. It is free in the city centre on Thursdays and Fridays, but paid for in the suburbs. Despite its title, it is available all day. The Metro North West is available free at Metrolink stops, rail stations and other busy locations. The MEN group distributes several local weekly free papers. 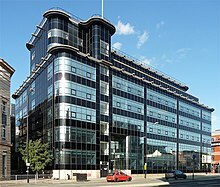 For many years most of the national newspapers had offices in Manchester: The Daily Telegraph, Daily Express, Daily Mail, The Daily Mirror, The Sun. Only The Daily Sport remains based in Manchester. At its height, ១៥០០ journalists were employed, though in the 1980s office closures began and today the "second Fleet Street" is no more. An attempt to launch a Northern daily newspaper, the North West Times, employing journalists made redundant by other titles, closed in 1988. Another attempt was made with the North West Enquirer, which hoped to provide a true "regional" newspaper for the North West, much in the same vein as the Yorkshire Post does for Yorkshire or The Northern Echo does for the North East; it folded in October 2006. ↑ ៤,០ ៤,១ "Manchester". Manchester. Oxford: Oxford University Press. March 2016. https://en.oxforddictionaries.com/definition/manchester។ បានយកមក ១៧ ធ្នូ ២០១៦. ↑ ជាលើកដំបូងនេះត្រូវបានរួមបញ្ចូល, Wythenshawe, was added to the city in 1931. ↑ Speake, Jennifer, រៀ. (2003)។ The Oxford Dictionary of Proverbs (4th រ.រ. )។ Oxford University Press។ ល.ស.ប.អ. 0-19-860524-2។ http://www.oxfordreference.com/view/10.1093/acref/9780199539536.001.0001/acref-9780199539536-e-1383?rskey=viR3Pw&result=2376។ បានយកមក 6 July 2007។ "What Manchester says today, the rest of England says tomorrow"
↑ "Victoria and Her Sisters". Simon Schama (presenter). A History of Britain. BBC One. 4 June 2002. No. 13. ↑ "Prescott ranks Manchester as second city"។ Manchester Evening News (M.E.N media)។ 3 February 2005។ http://www.manchestereveningnews.co.uk/news/greater-manchester-news/prescott-ranks-manchester-as-second-city-1056664។ បានយកមក 5 May 2009។ "We have had fantastic co-operation here in Manchester—our second city, I am prepared to concede." •Brown, Rachel (10 August 2007)។ "M.E.N Arena's world's top venue"។ Manchester Evening News (M.E.N. Media)។ បានដាក់ទុកឯកសារ ពី នៅថ្ងៃ 26 October 2013។ https://web.archive.org/web/20131026062551/http://www.manchestereveningnews.co.uk/whats-on/find-things-to-do/arenas-worlds-top-venue-1000549។ បានយកមក 12 August 2007។ "The M.E.N. Arena is the top-selling venue in the world." ↑ ១៤៤,០ ១៤៤,១ Manchester City Council (July 2016). ﻿Executive meeting: 16. Updated Draft St Johns Strategic regeneration framework and Factory Manchester﻿ (Report). 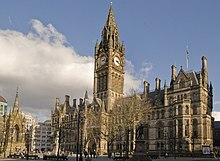 Manchester City Council. http://www.manchester.gov.uk/meetings/meeting/2619/executive។ បានយកមក 22 July 2016. Pdf. ↑ Little, Daran (1995)។ The Coronation Street Story។ London: Boxtree។ ទំ. 6។ ល.ស.ប.អ. 1-85283-464-1។ "Coronation Street is without doubt the most successful television programme in the world. ... what is today the world's longest running drama serial." ↑ "Obituary – David Plowright"។ The Independent។ 29 August 2006។ http://www.independent.co.uk/news/obituaries/david-plowright-413771.html។ បានយកមក 4 February 2012។ "As he himself liked to quote, not for nothing had Granada been dubbed the best commercial television company in the world." ↑ "Party People returns as presenter Rob McLoughlin celebrates thirtieth year at ITV"។ 25 January 2012។ បានដាក់ទុកឯកសារ ពី នៅថ្ងៃ 19 April 2012។ https://web.archive.org/web/20120419172834/http://www.how-do.co.uk/north-west-media-features/special-features/party-people-returns-as-presenter-rob-mcloughlin-celebrates-thirtieth-year-at-itv-201។ បានយកមក 4 February 2012។ "The Financial Times was to claim that 'Granada was probably the best commercial TV company in the world' – with respect to Thames TV; LWT and our American cousins – they may have been right but when that quote was hauled over reception in Quay Street I found it both inspiring and daunting."